Any kind of poster collecting and specifically movie poster collecting can be looked at as a wonderful way to decorate your home, a way to collect a subject of your choosing or as an investment and a place to put your money outside of the stock market. Either way, posters are rare and collectible and there are a limited number that dwindles every day; but more importantly, they are aesthetic, beautiful and valuable! Metropolis sold in 2012 for $1.2 million, in 2009 a 1931 Dracula sold for $310,700 and in 2013 a 1931 Frankenstein insert sold for $262,900. However, you decide to approach posters whether it is WW1, Travel, Magic, Circus, Advertising or Film; it is important to understand why and how they should be preserved for future generations. Our number one concern is to protect, preserve and save these pieces of our history. In this first issue, conservationists Harry and Elizabeth Proctor would like to introduce the basics of Linen Backing, how we do it and some of the common types of restoration that are typically done. 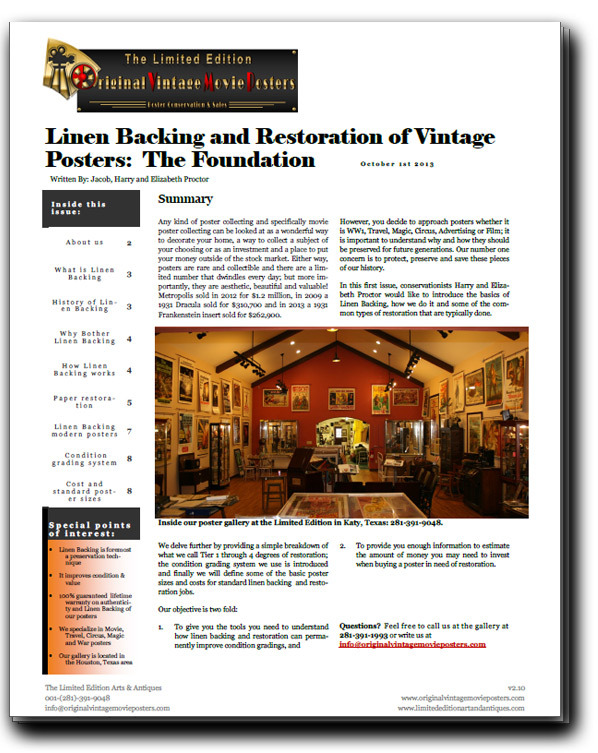 We delve further by providing a simple breakdown of what we call Tier 1 through 4 degrees of restoration; the condition grading system we use is introduced and finally we will define some of the basic poster sizes and costs for standard linen backing and restoration jobs. 2. To provide you enough information to estimate the amount of money you may need to invest when buying a poster in need of restoration.